IIT JEE Mains Online and Offline Mock Tests can help students with their preparation, performance evaluation and success in the engineering entrance test. Aspirants of IIT JEE Main 2018 can read here about role and importance of mock tests in cracking the most coveted engineering entrance exam. Few months remaining for IIT JEE Main 2018 and aspirants are leaving no stone unturned to crack the most sought after engineering exam of India. Students began their preparation at least a year before the JEE Main exam date, which is generally conducted in April every year. This year too, JEE Main 2018 will be conducted in two mode pen paper mode on April 8, 2018 and computer based test on April 15 and 16, 2018. Mostly, students join leading coaching institutes for IIT JEE Main exam to get the competitive edge and success in the IIT JEE Entrance Exam. These coaching institutes train students with updated study materials and practice papers to assess their performance in IIT JEE. However, there are some students who can not join JEE coaching due to various problems. Students who have to prepare for IIT JEE with self-studies, face problems with their performance assessment for the entrance exam. Previous Year Question Paper for JEE Main – Students can buy books on past year question papers of IIT JEE Main by various publishers in the market. Sample Papers for JEE Main – There are sample papers based on the syllabus of IIT JEE Main which can help students improve and cover the entire syllabus for the entrance exam. Online Test Materials – There are many websites providing test materials for JEE Mains, either they charge for downloading it or they provide free test material for IIT JEE. Websites for Mock Test – Various websites provide performance assessment test which any aspirant can take by registering themselves. These online mock tests for IIT JEE gives aspirants a real-time test experience and hence, help them improve their test-taking skills. 1. Awareness about test pattern – Before taking the test, the aspirants need to know about the exam pattern of IIT JEE Mains. Students may know the syllabus of JEE Main, but they need to get familiar with the type of questions, marks, difficulty level, as well as attempting the test. With help of mock test for JEE Main; they can get an idea of the actual engineering entrance exam. 2. Performance Evaluation – After taking the test students get an analysis report which shows marks in each section of JEE Mains mock test. Students can evaluate this report to know their performance stage. Whether they have excelled the test or they need to practice more for the test. 3. Help Improve Speed and Accuracy – As IIT JEE Mains is offline as well as online, and students can choose as per their preference. So the students can practice mock test paper either online or offline as per their convenience and choice. If they are appearing for Computer Based Test, then the online mock test will be helpful in increasing speed and accuracy or if they are appearing for pen paper based IITJEE Main exam, then they can take offline mock papers which will help them improve question paper solving time and filling OMR sheet within time. 4. Motivation and self-confidence – Students can take a test to evaluate their preparation level after they have practised for JEE Main. So, if they take mock tests then they will be confident about their qualification in the test and also, on receiving performance analysis report they will motivate themselves to improve more and score better every time. 5. 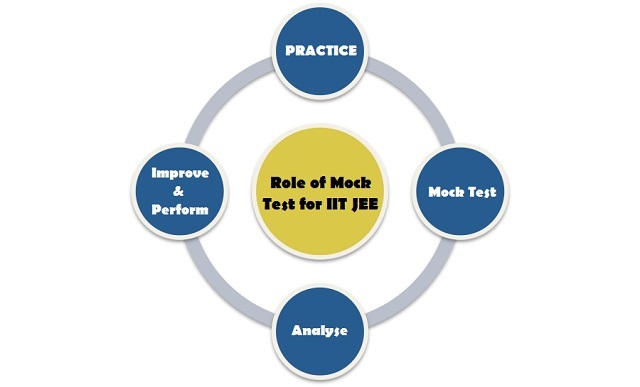 Strength and Weaknesses – Mock test are subject specific, so if aspirants are taking the mock test for IIT JEE, they will be taking the mock test for three subjects that are Physics, Chemistry and Mathematics. This way, they will be able to know their weaker section and will be able to aim and improve in that subject as compared to the sections they are scoring well in. Note: Do not stop practising even if you score full marks in the mock test for each section. The more mock test you take more the chances of cracking IIT JEE 2018 exam. 6. Helps with Anxiety about test – Sometimes, students prepare really well for the exam, but just by the recurring thoughts about not being able to qualify in the exam due to competition, they get anxiety attacks and fear to appear for the test or even if they appear for the test they are unable to perform due to nervousness. So, with mock test students can get a demo of the entrance exam and drive away their uneasiness for the test. 7. Competitive Edge – As students take more and more mock test, they improve each time and score better. Their speed and accuracy increase with more practice and they do their best. It increases their success rate in the entrance exam as compared to the aspirants who have not taken the mock tests. Next Article JEE Advanced 2018 website launched by IIT Kanpur for computer based exam on 20 May: Are you ready?